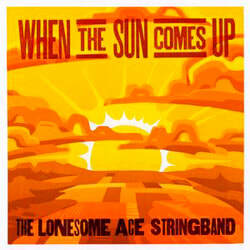 If we assume and accept for the sake of argument, but mainly for the purposes of this review, that there are just a few albums that genuinely link music from that 'old weird America' to modern Bluegrass, one of those albums certainly has to be this excellent new recording 'When the sun comes up' from the hugely talented trio of The Lonesome Ace Stringband. I've never really been a great fan of bluegrass but that is probably more for the reason that I may not have always heard the best examples, feeling that the more frenetic the playing the higher rating the band seems to have. That may well be an over simplification but you can only tell it as you see (or hear) it and there are more than enough strains and offshoots of country music that I do love and can get my teeth into! 'When the sun comes up' however, seems to catch the spirit of modern bluegrass without any of the often frenzied playing, this band preferring to let the song breathe rather than feeling the need to play at breakneck pace to exhibit their musical talents, which none the less will be obvious to all who hear this recording. In a nutshell, they blend the high lonesomeness of bluegrass with the equally high lonesome spirit of eerie old timey music, creating an almost unique sub genre. The trio consists of Chris Coole on banjo, guitar and vocals, Max Heineman, bass and vocals and John Showman on fiddle and vocals and production duties shared between the band. There are thirteen tracks on the recording with three of them being excellent instrumentals. Two tracks are traditional, two written by Max Heineman, four by Chris Coole and three by John Showman with one by John Hurt, one by S. Lebowsky and H. Newman and one by D. Haquard. As you can see, quite a diverse mixture of songs and writers ranging from old and traditional folk, to blues and to modern 'old timey,' all performed with great drive, commitment and musical prowess. An incredibly strong, dynamic vocal from Max Heineman supported by the banjo gets O' Grady Road underway, joined by thudding, almost percussive bass and keening fiddle on a genuinely high lonesome ballad that evokes an old Appalachian setting, with harmonies from the other two band members adding depth to the song. There's a haunting banjo intro on American refugee/Winnebago man with a restrained fiddle eventually coming in on this floaty ethereal tune from Chris Coole, the double bass soon joining the fray and rooting proceedings as it segues into its partner, the John Showman penned Winnebago man. The speed is increased exponentially with the three instruments working beautifully together on the one track that can be said to be performed at a frenetic bluegrass rate! We start with the sawing fiddle and John Showman's evocative vocal on the self penned, Pretty Boy Floyd, a stirring tale about the old gangster, with beautiful support from the foundation stone bass and with the banjo weaving its way through the song with a nice reflective fiddle break aided by some evocative harmonies. On Life's treasure a gentle, haunting high lonesome fiddle intro is soon joined by Chris Coole's lead vocal on a song on which the trio exercise their superb harmonies during a tale on which you can almost see views of the high Appalachians. Civil wars is driven by a spirited 'folksy' fiddle with banjo and thudding bass on a song that has the feel of an old British Isles ballad or could just as easily be from the American civil war, written and sung by Max Heineman. The Lonesome Ace Stringband seem to be able to create that almost otherworldly eerie old time atmosphere in which you can virtually see the misty peaks of the high Appalachians and the deep cut valleys that contain the old lost hollers! It is that sort of hugely atmospheric recording that most listeners will find themselves getting lost in. Mixed with that is a modern attitude and production values plus the myriad influences that these three men have absorbed, something that was not available to the old timers, culminating in an album that genuinely contains something for everyone.